Making a badge or record claim? Entering a comp? Make sure you are up to date with recent rule changes. 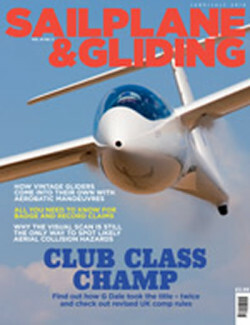 Read how G Dale became a Club Class champ – twice, and discover why vintage gliders compete favourably with their modern counterparts incompetitive aerobatics. It’s all in the June/July issue of S&G, along with essential advice on the ONLY way to spot a likely aerial collision hazard. British Team member G Dale went to Nitra to practise for the Worlds and came home with two back-to-back Club Class titles, in the Pribina Cup and the Flight Challenge Cup. The flying was, he says, great fun. Exciting without being hard enough to be a lottery or frighteningly dangerous, and different enough to competing in the UK to really extend your experience. In the last issue we looked at how competitive aerobatics can improve your flying. 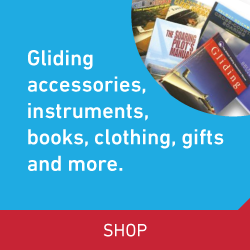 Here Graham Saw reveals how vintage gliders come into their own with slower or tighter aerobatic manoeuvres. He also has a theory that the sight of a colourful wooden glider arcing gracefully through the sky might just win the hearts of judges and influence their judging! We have heard reports of some impressive flights recently. If you are thinking of making a badge or record claim, make sure you have read up on recent changes to the Sporting Code. FAI Badges Officer Basil Fairston summarises the changes for Official Observers and experienced pilots, and provides a run through of the procedures for pilots new to badge flying. There have also been some significant changes to the Competition Rules that competition pilots should be aware of. Neil Goudie and James Ewence summarise the significant changes, which have taken into account feedback received by the BGA Comps Committee from competition pilots. Whether you are planning a badge or record flight, taking part in a comp, soaring cross-country or just flying locally, make time to read the article from CAA Safety Promotion Officer David Cockburn and discover why the visual scan is still the ONLY way to spot likely aerial collision hazards. Also in this issue: BGA Chairman Patrick Naegeli comments on the resourcefulness of glider pilots taking advantage of the disruption caused by volcanic ash, and on the BGA’s response to Eurocontrol’s draft rules on the Standardised European Rules of the Air. BGA Development Officer Alison Randle looks at how to make the most of the summer, with advice from the BGA National Coach and the BGA Communications Officer. Platypus talks to Hans-Werner Grosse, chief initiator of the ETA project. Justin Wills recalls his memorable – and expensive – Diamond height flight of 40 years ago. Alan Lapworth looks at how conditions determine the behaviour of near surface winds. The Shuttleworth Collection now owns a vintage glider, which, as Debb Evans reveals, looks set to steal the thunder of the newest and noisiest aeroplanes in the Collection. Mike Fox offers valuable advice on getting awayfrom winch (or aerotow) launches. The CAA’s David Cockburn explains why the visual scan is still the only way to spot a likelyaerial collision hazard. Andy Perkins looks at the role Juniors can play in determining a successful future for the sport. Neil Goudie and James Ewence provide a summary of the significant changes to the Competition Rules. Tricia Pearson reports on a successfulsafety day at The Gliding Centre and last, but not least, there’s the BGA club annual statistics. Planning a badge or record claim?